A few weeks back at the end of the Trump transition and around the time of the inauguration, there were multiple polls that were posted by the mainstream media. Before I start debunking these polls, I want to say that based on the polls that the Washington Post and CNN took, they reported their findings factually. However, their polls do not represent the correct demographics of the United States. This article is going to be very heavily numbers and statistics based. The first poll to discuss is the Barack Obama approval poll that the Washington Post reported. For their poll, they sampled 23% republicans, 31% democrats, and 37% independents for their poll. This is where the red flags immediately start popping up. According to the 2015 Gallup Poll, America identifies as 38% conservative, 24% liberal, and 34% independent. 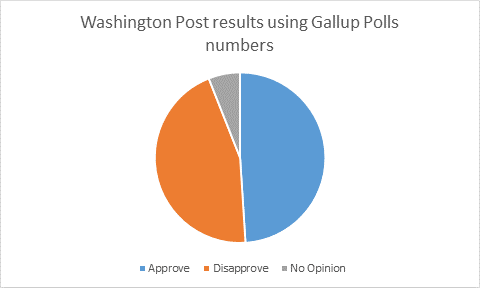 The graph Gallup Poll 2015 represents these numbers and the graph Washington Post sample is what they sampled for their poll. Due to the difference in sampling, it immediately means that their numbers don’t show a true representation of opinions in the USA. There was some good information in their polling though. They found that 18% of republicans approved of Barack Obamas presidency, and 80% disapproved. 90% of democrats approved of his presidency and 9% disapproved. 61% of independents approved and 37% disapproved. 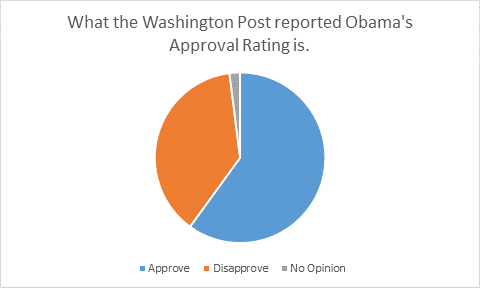 From their findings, the Washington post reported that 60% of Americans approved of Barack Obama, 38% disapproved, and 2% had no opinion. If you were to take their findings from their poll and cross reference it with the Gallup Poll numbers, you would see that when given true demographics, former president Barack Obama approval rating would be much lower than they reported. Cross referencing the Gallup poll, 47% of Americans approved of Barack Obama, 42% disapproved, and 11% had no opinion. Here are the graphs to represent that. What does this mean? It means there was either intentional bias when selecting people to poll, or unintentional bias by just selecting the first 1,000 people they surveyed. Either way, what they reported was not a true representation of the thoughts of average America and they fed it to the American public like it was. Were they trying to boost the approval of Barack Obama so that he would be remembered favorably among the public and in the history books? One can only speculate. The next poll we need to look at that is the poll reported by CNN in regards to the approval rating for the Trump transition team. The first thing to do is reference the polling sample. For their poll, CNN sampled 24% republicans, 32% democrats, and 34% independents. Once again, the 2015 Gallup poll found that 38% of America identified as conservative, 24% identified as liberal, and 34% identified as independent. Here is what the CNN sample looks like side by side with the Gallup Poll findings. 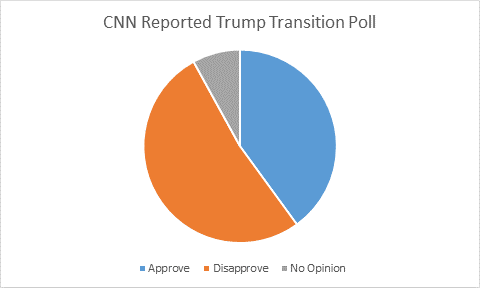 CNN reported that the way Trump handled his transition had a 40% approval ratings, 52% disapproval rating, and that 8% of those polled had no opinion on the matter. If you were to take their findings and cross reference them with the true demographics of the USA, you would find that it was really a 49% approval rating for Trumps transition, 42% disapproval rating, and 11% of Americans had no opinion on the matter. Here is what the difference between CNN and the Gallup Poll cross referenced with CNN’s findings looks like. CNN reported that Trump during his transition only had a 40% approval rating when in reality it is closer to 49%. This week Brian Stelter, senior media correspondent for CNN and host of Reliable Sources on CNN, was still referencing this poll. It is no secret that the Trump administration and the mainstream media have no love for each other. CNN has been doing everything in their power to spin information to discredit Donald Trump for the last two years. Just to be clear, 49% approval rating is nothing to brag about, but it is much better than the 40% CNN reported. If this is how CNN and the Washington post conduct polls, then it is no surprise why the majority of those in the main stream media got this election cycle so wrong. Although the information they polled was correct based on their own polls, it doesn’t represent America at all. This is the first time that I have noticed where Kellyanne Conway’s “Alternative Facts” is actually represented. CNN and the Washington Post conducted polls and reported that information according to their findings which according to their polls were facts. The alternative facts are the numbers that I represented here in this article in order to show the skewed information. Other facts include that they did not use a poll base that is actually representative of the demographics of the USA. Were they conducting these polls this way to attempt to sway public opinion? There is no way to know, because if they were doing that, they would never admit to doing that or risk blowing what little remains of their credibility. The job of the media is to report facts in order to hold those in power accountable for their actions and tell the public what is actually going on. It is the job of the media to make sure that we have an informed public for when it comes time to vote during elections. It is time that we start holding the media accountable for their actions as well. If we allow them to skew public perception on something like approval ratings, what else are they going to try to skew in the future? With all the talk of fake news recently, it is imperative that we force our news outlets to report factual information. Allowing biased information on our news programs blows the credibility of the media with the public. When the public does not believe the media, we pave the way for bad candidates to gain national traction during election cycles. When poor candidates gain national traction and the media can’t correctly rip them down due to their own biases and lack of credibility, we get an uninformed electorate. When we have an uninformed electorate, we end up getting Hillary Clinton and Donald Trump, two awful candidates, as the two main candidates for President of the United States and leader of the free world. Where is the outrage at the media for coming so close to completely blowing their credibility? Where is the outrage for letting the media become so polarized and partisan that they are now spinning the truth for their own personal agenda? Where is the outrage at the media for allowing the media to report subjective truths and not THE truth?